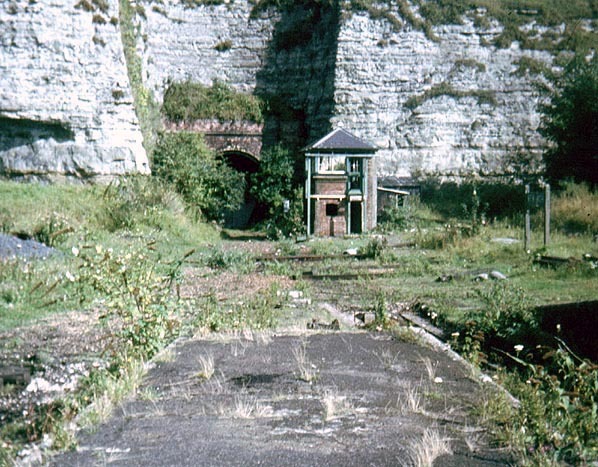 Present state: Demolished - the site is now a light industrial estate and little survives apart from the tunnel portal within a Southern Water compound and some excavated chambers in the quarry face that by local merchants when the station was in use. 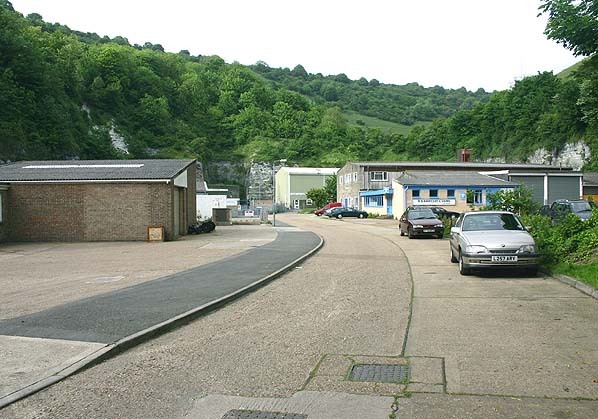 Some of them are still used by the owners of the industrial units. 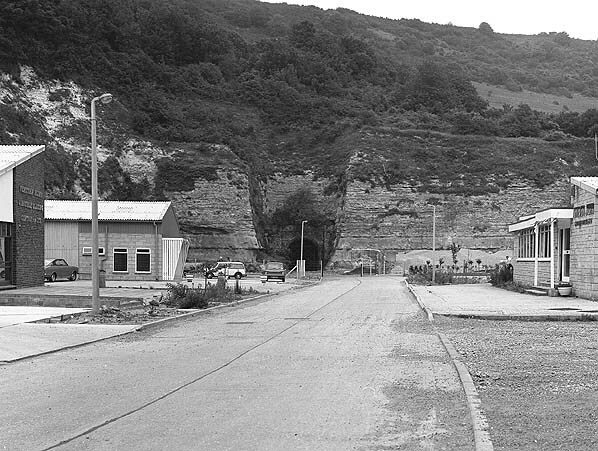 Notes: When Ventnor Station was first opened 1866 on the site of an existing operating quarry only temporary accommodation was provided. 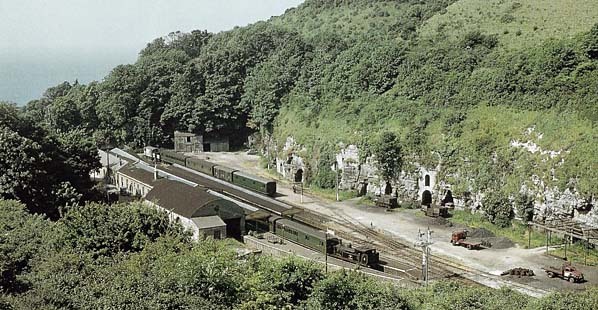 A permanent station was eventually built including a large goods yard with three sidings and coal ground for local merchants who were accommodated in quarried chambers in the cliff face. 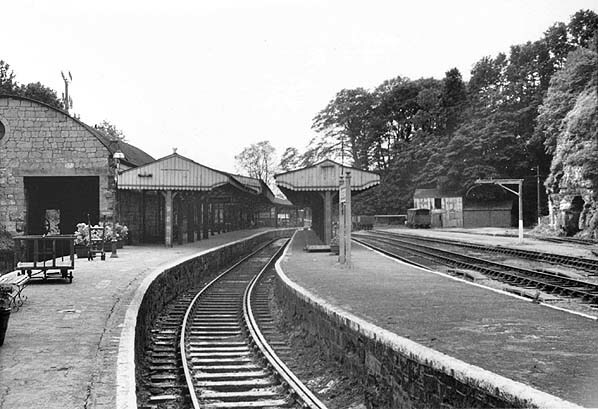 Although there were only two passengers roads the station was provided with three platform faces on two island platforms. 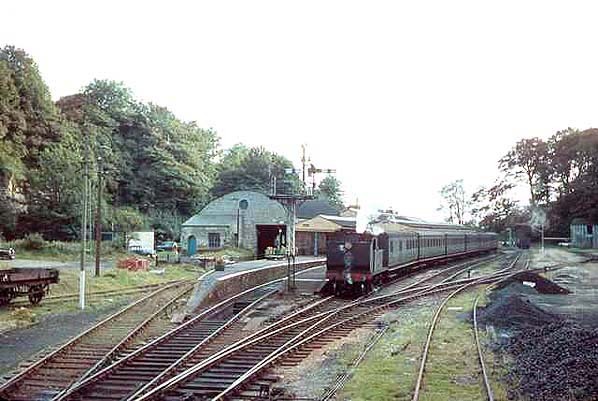 The fourth platform face was for goods with a large goods shed provided at the end of the platform. 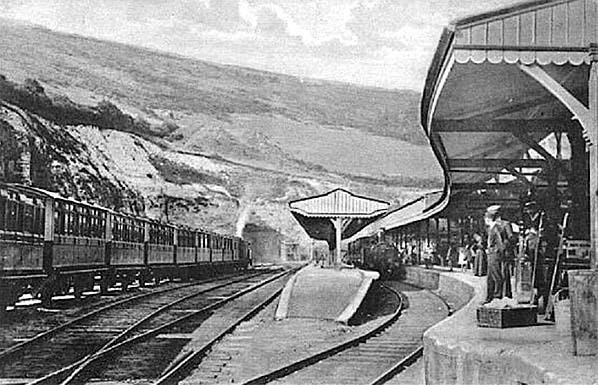 After several failed attempts to build a railway to Ventnor, a Bill was proposed by the Isle of Wight Railway in 1860 for a line from Ryde to Ventnor. 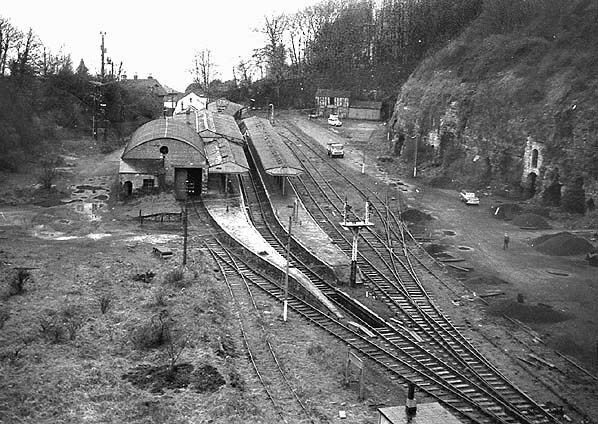 An Act was passed authorising the building of the line and by 1864 the line had reached Shanklin but following objections from landowners the intended route through Luccombe and Bonchurch was dropped in favour of a new route from the north passing through Wroxall. 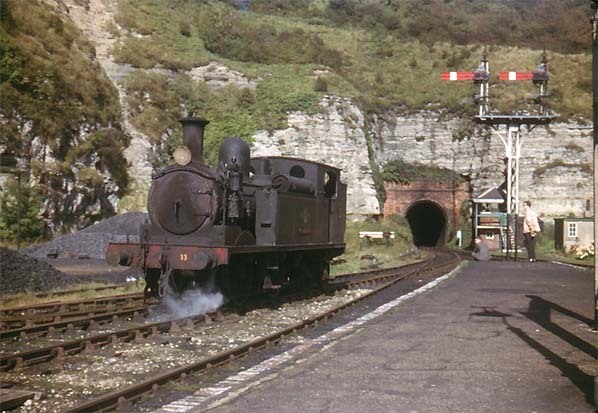 This route required the construction of a 1312 yard tunnel under St. Boniface Down; the line eventually reached Ventnor in 1866. From the opening the line was well used losing little traffic to the IWCR who opened a branch from Merstone - Ventnor Town in 1900. 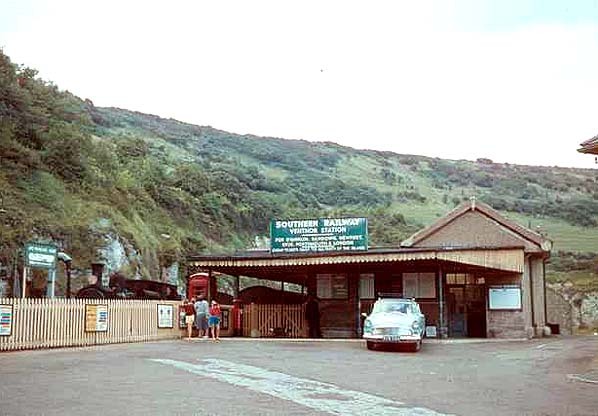 Ventnor Town was in fact located a mile west of the town centre and was never well used and although the IWR station was also inconveniently sited high above the town it provided a faster and therefore more poplar route from Ryde. and initially there were few changes. However this was short lived; improved bus services and the popularity of the motor car soon and holidays abroad led to dwindling passenger numbers. 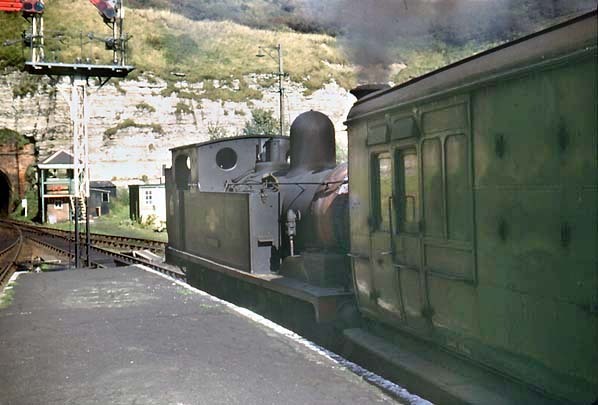 Merstone - Ventnor was the first line to close in 1952 leaving the IWR as the only route serving the town. The following year the Bembridge branch closed. of the third rail electrification to take place. The tube trains were brought across on the car-ferry with the passenger service reinstated on 20 March 1967. The line is still operated by ex-tube stock as the Island Line. 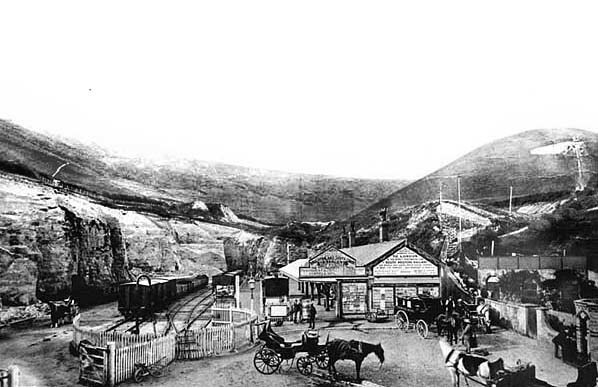 An early view of Ventnor station c. 1890s. and a turntable. At this time there were no buildings on the platform. 1898 1:2,500 OS map. The station has ben greatly enlarged requiring further excavation of the hillside. We now see platform buildings. a goods shed and more sidings. one serving a coal yard on the west side, The 10-ton yard crane is also shown. A station hotel has also been built. 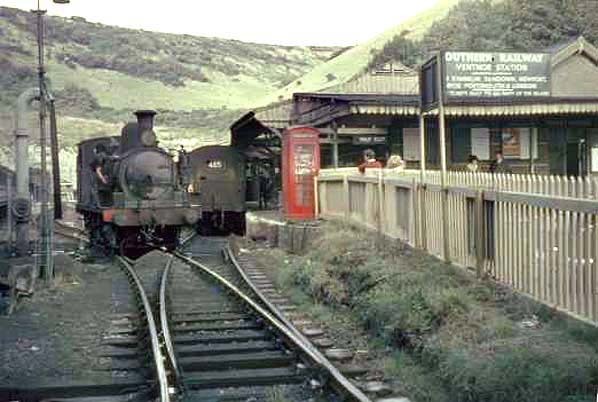 Ventnor Station in June 1961.